I'm not finding much in the way of information on transferring samples and ensoniq instruments using Windows to transfer to the SyQuest drive. 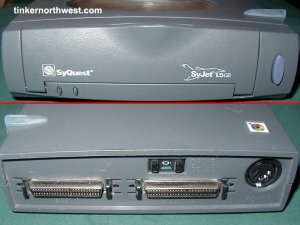 Does anyone have any experience with the EPSm and working with SCSI drives, and transferring sounds using Windows? I primarily use Windows 10, but have another Windows XP system that I could potentially use for any ancient stuff. Appreciate any info! Which sampler do you have? the EPS16+ or the one that came before it the EPS? There is a big difference, the latter is restricted on all things scsi as it was all being developed at that time. You may well care to read up on the Tweakheadz scsi h**l webpage. Term power and termination may well be needed, I use a zip drive that does all that automatically, most times! I have the EPS16+, for easy sample transfer over midi use SampleWrench, I think it's the only one that works easy on most Windows computers. As for scsi transfer, ya stuck, I resort to using old Mac/OS7/Alchemy they make a perfect setup. I gave up on Windows based scsi transfers as it gets into scsi cards, drivers, apps that can use them... someone might know though. There's a ton of info about nowerdays, esp. on YT, many of us have made vides on how-to. Basically just hoping to get some input from others who use an EPSm with SCSI. I am aware of the MIDI method for transferring sounds, but with the amount I'm planning to transfer it seems it would take far too long and be cumbersome ( https://www.chickensys.com/kb/eps-asr/015.html ) - SCSI speeds are very fast. I think the main problem I'm seeing is that there are not many options for working with SCSI in Windows 10, primarly the driver being the issue. Was hoping someone might be doing this on the forum somehow that could share some info. I think since I have an older PC with the older PCI slots, and Windows XP I should pursue this method since the hardware and software support for this were alive and kicking in those days. I have a USB to SCSI adapter, but Windows 10 refuses to recognize it, and even Windows XP is unable. I'll prob just find an older PCI card and try it with Chicken Sys, I know I was able to get that to work with my old SCSI zip drive and SCSI hard drive for my Korg Triton samples. ok, I've had a quick look at the review, yeh that looks to me to be what we now call a EPS "Classic" - the one before the EPS16+ (unless I have that wrong) the scsi spec on that is not as robust as the EPS16+. I think there is also something with it not reading CDrom drives, do check. I would suggest do try midi sample transfers, they are not as slow as you may read, in fact I do them all the time if I'm not creating some mega-Instrument. I notice that review acually mentions "Blank Software's Alchemy" - yey, it rocks! However if you're not familair with the tech, it could be a bumpy uphill journey until it's all working. It's what I always turn to for anything "serious". At least try SampleWrench, it will get you going faster than anything else. Just something to consider, the EPS16 needs two way midi connections too, it uses this for commands and data gets sent over scsi, I'd expect the EPS to be the same. Also do try any demo software from Chick. Sys. before you give them money, I have history with them, they took my money and gave me time wasiitng rubbish. You MUST try their demos fully before you buy, they are well known for selling flaky software. I tend to keep an old Win98se/DOS for this age of kit, it usually makes things simpler in the long run. 68k Mac/OS7 ruled at the time. Sit tight, I know a number of other members in this site that are clued up on this stuff also. zorkiii wrote: I think the main problem I'm seeing is that there are not many options for working with SCSI in Windows 10, primarly the driver being the issue. Was hoping someone might be doing this on the forum somehow that could share some info. Adaptec AIC-7870 PCI card in an XP machine is probably the easiest solution. Use Total Commander + EnsoniqFS plugin if you don't want to deal with ChickenSys -- not the most loved software in the world.